Whisk together eggs, milk, chives, basil, pepper, and salt in a bowl. Heat oil in a 12-inch ovenproof nonstick skillet (if handle is plastic, wrap it in a double layer of foil) over moderate heat until hot but not smoking. 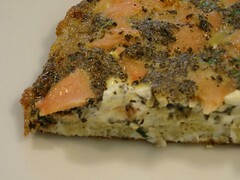 Pour egg mixture into skillet and scatter cream cheese pieces on top, then cook, lifting up cooked egg around edges using a spatula to let raw egg flow underneath, until frittata is set on bottom and egg is almost set but still moist on top, 3 to 5 minutes. Remove from heat. 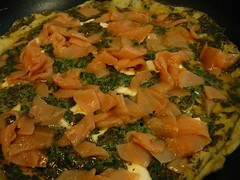 Sprinkle salmon all over frittata, then press on salmon lightly and shake skillet to allow salmon to settle into top. Broil frittata about 6 inches from heat until set, slightly puffed, and golden in patches, 1 to 1 1/2 minutes. Cool 5 minutes, then loosen edge with spatula and slide onto a large plate. Cut into wedges and serve warm or at room temperature. Notes: Though this is approximately four servings (or more with additional dishes, such as muffins or mini-bagels on the side), I polished it off with only the help of one taster. Bring broth and white wine to simmer in heavy small saucepan over medium heat. Reduce heat to low; keep mixture warm. Heat oil and butter in heavy medium saucepan over medium heat. Add shallot and rice and saute until translucent, about 2 minutes. Add 1 cup of broth/wine mixture to rice. Simmer, stirring often. Mix in sage. Cook until rice is tender but still firm to bite and risotto is creamy, adding remaining broth mixture 1/4 cupful at a time if risotto is dry. Mix in mushrooms, Gorgonzola and pear. Cook until cheese melts and pear is heated through, about 1 minute. Notes: I didn't quite get the correct consistency on this one but it was very tasty and will be well worth trying again. With respect to the original recipe, I substituted chicken broth for the vegetable broth and bumped the amount of cheese up for more enriched taste. Also, the mushrooms added a nice texture contrast. For 1 1/2 pounds steak. Mix spice ingredients, except olive oil, in bowl. Using 3 TBSP of mixture, coat steak(s) well. Whisk olive oil with the rest of the rub and set aside. Cover steak(s) and refrigerate for one day. Heat the grill to medium-high and brush steaks with oil rub. Cook (five minutes per side for medium rare) and continue to baste with oil. Let rest 10 minutes under foil and serve. Notes: This spice rub is from Marinades: the Secret of Great Grilling by Melanie Barnard. I used the same method here as in Spicy Steak Rub. A mild and complex taste, but it was agreed that the earlier recipe was the better of the two. Still, this was nice and easy cooking on a hot summer day. I might try the same mix with lamb burgers at some date in the future. Heat a pot over medium to medium high heat. Add extra-virgin olive oil, 3 turns of the pan, and the turkey meat. Season the meat with: chili powder, grill seasoning, cumin, Worcestershire and hot sauce. Break up the meat with the back of a wooden spoon into small crumbles. Brown meat 5 minutes, then add onions and chopped peppers and cook 10 minutes more. Add beer and deglaze the pan, scraping up the drippings and cooking off the alcohol. Add tomato sauce and barbecue sauce and bring to a bubble. If using corn kernels add them now. Let chili simmer 10 minutes. Adjust seasonings and heat level to your taste. Remove from heat and serve with tortilla chips. Notes: This was pretty darn spicy. It ended up setting up a steady burn that lasted many minutes after my serving had been consumed. So far I've had one other taster; they claimed it was too hot. I'm waiting on another opinion as I saved a couple servings worth in the freezer for a later date. In a small bowl combine the above ingredients. Place 1 pound medium shrimp in a single layer in a shallow glass dish. Add marinade, turning or stirring to coat. Cover and refrigerate for 30 minutes. 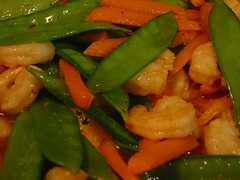 Stirfy in a little vegetable oil with carrot strips and snow peas. Serve over rice. Notes: This was simple and quick. Fairly tasty though not fancy. Mix spice ingredients, except olive oil, in bowl. Using 3 TBSP of mixture, coat steak(s) well. Whisk olive oil with the rest of the rub and set aside. Cover steak(s) and refrigerate for one day. Heat the grill to medium-high and brush steaks with oil rub. Cook (five minutes per side for medium rare) and continue to baste with oil. Let rest 10 minutes under foil and serve. Notes: This was actually my Memorial Day recipe but things have been very busy of late and I haven't had time to update the blog. In any case, I had in mind that I wanted to do some sort of Mexican-influenced spice rub for steak, but wasn't turning up what I was after exactly. I turned to Nick at The Original Hot Sauce Blog and Joe and Linda of The Hot Zone Online for advice, hoping their interest in all things spicy would be of assistance. I got some good suggestions, and eventually settled on the recipe above. And it turned out marvelous, if I do say so myself.